Record Prices For Fine Art Pictures.  Painted by Mark Rothko (1903-70).  Sold at auction in 2012, for $86.9 million.  Seller: The David Pincus Estate. Buyer: unknown. See also: Mark Rothko's Paintings (1938-70). The most expensive of all abstract paintings by a 20th century painter, and the highest price yet paid for a Rothko (the next highest is $72.8 million for his 1950 painting White Center: Yellow, Pink and Lavender on Rose bought at Sotheby's by Sheikh Hamad bin Khalifa Al-Thani in 2007), the work - one of Rothko's masterpieces of Colour Field Painting - comprises blocks of orange and yellow paint on a red background. Not seen for the past 45 years, it was secured by an anonymous buyer after one of the longest bidding matches seen in a contemporary art sale, with bids leaping in increments of a million or sometimes two million dollars. For an interpretation of modern pictures like this, see: Analysis of Modern Paintings (1800-2000).  Sold at auction in 2008, for $86.3 million.  Seller: European art collection. Buyer: Roman Abramovich. A challenging masterpiece of postmodernist art by one of Europe's Top Contemporary Artists and, Francis Bacons Triptych, is regarded as the most important painting by the artist in private hands. It was the focal work of Bacon's most significant exhibition of new work of the 1970s - one of the most sustained and productive periods in his career - which was staged at the Galerie Claude Bernard in Paris in 1977. In this triptych, Bacon utilizes Greek Mythology to depict his personal fate, disclosing in a single work his full range of imagery and iconography. It is one of his most complex and imaginative works and bristles with classical narrative, much too complex to explain in a couple of sentences. Not surprisingly, given the quality of the work and the fact that Sotheby's had previously achieved five world record prices for works by Francis Bacon, Triptych smashed its pre-sale estimate of $70 million. 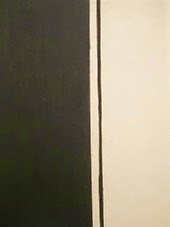  Painted by Barnett Newman (1905-70).  Sold at auction in 2014, for $142.4 million. See also: Abstract Expressionist Painting. A 9½-foot-high painting consisting of black pigment on canvas, Black Fire I doubled the artist's previous auction record of $43.8 million - for Onement VI (1953) - achieved at Sotheby's New York in May 2013. On loan to the Philadelphia Museum of Art for almost 30 years, it was bought by an anonymous phone bidder after a five-minute bidding contest. In this work, Newman used the same raw canvas and black palette that he employed for his series of 14 paintings, entitled The Stations of the Cross (1958-66). His aim was to render the raw canvas, relative to the black pigment, in such a way that it would "become colour" and possess its own characteristic of light. One of the key exponents of American abstract expressionism, Barnett Newman was associated with Colour Field Painting, along with Rothko and Clyfford Still (1904-80).  Seller: Siegfried Kramarsky family: Buyer: Ryoei Saito.  See also: Post-Impressionism in Holland. 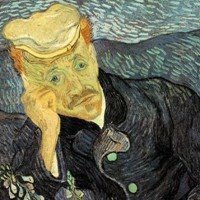 A key figure in the history of expressionist painting, Van Gogh painted two portraits of Dr Gachet - the last-ditch psychiatrist with whom he stayed immediately prior to his suicide - each with a differing colour scheme. In both however, Van Gogh uses his unique style of expressionism to convey his view of Gachet's presence. The other portrait hangs in the Musee d'Orsay in Paris: sold in 1990 at Christie's for a world record price to the Japanese industrialist Ryoei Saito, it was reportedly resold to a European buyer in 1997 or 1998 for $70-$90 million. In both, Van Gogh demonstrates a strong sense of empathy with the 62-year old widower Gachet, due to the latter's eccentricities and melancholic unease, and his attempt to seek solace in hard work. One of the artist's most sympathetic expressionist portraits, the work here deliberately conveys the doctor's "heartbroken expression", reinforced by the addition of a glass with sprigs of foxglove - a homeopathic plant used to treat depression, as well as two French novels about the mental stresses of Parisian life. For more about Van Gogh's style, see: Expressionist movement (1880s on).  Sold at Christie's New York in November 2014, for $81.9 million.  Seller: WestSpiel (Aachen). Buyer: unknown. See also: Andy Warhol's Pop Art. Warhol's "Triple Elvis" (Ferus Type) - created from silkscreen ink and silver paint - is taken from a publicity photograph for Elvis's 1960 movie "Flaming Star," which shows the singer in three overlapping images. Busting it's pre-sale estimate of around $60 million, it was hammered down for $81.9 million at Christie's (New York), in November 2014. An excellent example of Warhol's style of celebrity pop art, it is his second most expensive screenprint after "Silver Car Crash (Double Disaster)" (1963) which sold at Sotheby's in 2013, making him one of the best portrait artists of the mid-twentieth century and arguably the dominant figure in contemporary art of this period.  Sold at auction in 2014, for $80.8 million.  Seller: Unknown Taiwanese businessman. Buyer: Unknown Asian buyer. 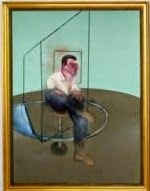 In this triptych painting - rendered in a style similar to that used to create his record-breaking work Three Studies of Lucian Freud (1969) Bacon produces a study of his closest companion, John Edwards, an illiterate barman in the East End of London. One of Bacon's unique expressionist paintings, the work also contains elements of surrealism. On Bacon's death in 1992, Edwards inherited the estate and donated the artist's art studio to the Hugh Lane gallery in Dublin, where it now stands. In the late 90s Edwards settled in Thailand where he died in 2003.  Painted by Claude Monet (1840-1926).  Sold at auction in 2008, for $80.5 million. One of the great Impressionist landscape paintings by one of the world's best landscape artists, this work is an outstanding large-scale example of Claude Monet's Waterlilies series. 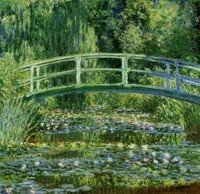 Influenced by Japonism, it features the famous Japanese bridge in Monet's water garden at Giverny, demonstrating his fascination with plein-air painting and his pursuit of pure Impressionism. Le Bassin aux Nympheas is the most expensive painting by Monet and the second most expensive work of Impressionism after Bal au Moulin de la Galette by Renoir. It exemplifies the artist's lifelong attempt to master the replication of light: a task he continued to pursue until the very end. For more, see: Characteristics of Impressionist Painting 1870-1910.  Painted by Pierre-Auguste Renoir (1841-1919).  Seller: Betsey Whitney. Buyer: Ryoei Saito. 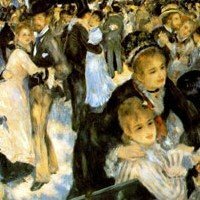 This Renoir masterpiece, the most expensive example of Impressionism ever sold, portrays a Sunday afternoon dance in a Montmartre dance garden. It is one of the best-known Impressionist paintings, and highlights the artist's unique skill in reproducing dappled light, which infuses the whole work with a soft-focus quality. Also visible in this genre painting are several of Renoir's artist friends. Curiously, the painting has two things in common with Van Gogh's Portrait of Dr Gachet. First, it too was purchased by Ryoei Saito and subsequently resold at a loss to a European art collector. Second, it too has a 'sister' version - a larger canvas which (again like the other Gachet) hangs in the Musee dOrsay. It ranks alongside The Luncheon of the Boating Party (1881, Phillips Collection) - also by Renoir - as one of the greatest genre paintings in the pantheon of Impressionist art.  Painted by Peter Paul Rubens (1577-1640).  Sold at auction in 2002, for $76.7 million.  Seller: Austrian art collector. Buyer: Kenneth Thomson. Smashing its pre-sale estimate of £5 million, this Flemish painting is the most expensive of all religious paintings and the costliest work by an Old Master. It was purchased by Lord Thomson who later donated it to the Art Gallery of Ontario, Canada. 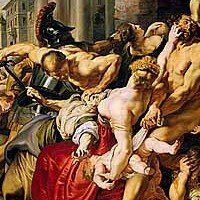 A superb example of history painting, the work depicts a particularly savage event in Biblical art - the massacre of all new-born boys, ordered by Herod to prevent the emergence of a Messiah - and shows why Rubens is regarded as one of the best history painters of the 17th century. The composition contains all Rubens' usual themes: movement, muscle, flesh and above all, emotion. Look at his use of diagonals, colour contrasts and relationships between subjects - all of which help to involve the spectator. Compare this Flemish Baroque version of the story with the earlier Massacre of the Innocents by Pieter Bruegel.  Sold at auction in 2007, for $72.8 million.  Seller: David Rockefeller. Buyer: Sheikh Hamad bin Khalifa Al-Thani. The most expensive piece of American art sold at auction, this signature work by one of the great abstract painters of the mid-20th century, and a pioneer of Colour Field Painting, is the second most expensive post-war painting sold at auction, after Francis Bacon's Triptych. Art critics consider it to be the first significant example of Rothko's famous 'multiform' stratified style of abstract expressionism. It was in the winter of 1948-9 that Rothko stumbled across his multiform concept, in which blocks of contrasting but complementary colour pigments are arranged vertically on huge canvases, in order to overwhelm or envelop the spectator. After applying a thin mixture of binder and pigment onto an untreated canvas, he would add layer after layer of thinned oils to produce a dense bed of overlapping colour and shape. Although he began with rich vibrant colour schemes, he later turned to more muted colours - a sign, according to some, of his growing depression. A heavy drinker, smoker and bad-eater, Rothko - despite having created some of the greatest 20th century paintings - committed suicide at the age of 66 by taking an overdose of anti-depressants and slashing his wrists with a razor. Rothko's giant-sized colour-saturated abstract canvases paved the way for movements like Hard Edge Painting and other 1960s styles of Post-Painterly Abstraction. Now ranked among the greatest of 20th century painters within the genre of non-objective art, his works have influenced numerous European artists from several different schools. Note: The most expensive painting by a living artist, is "Domplatz, Mailand" (Cathedral Square, Milan) (1968) by Gerhard Richter (b.1932), which sold at Sotheby's New York for $37.1 million.  For the top USA galleries, see: Art Museums in America.  For the best European venues, see: Art Museums in Europe.  For more about top-priced pictures, see: Homepage.